Yoga Vasishtha (योग-वासिष्ठ) is the inner journey of Lord Rama in the story of Ramayana. When the Prince gets very confused and loses the purpose in life, Maharishi Vasishtha illumines him with knowledge about reality. Yoga Vasishtha is a glorious conversation between a great Master who knows the Self and an able disciple who is qualified to know It. Yoga Vasistha has six different parts and among them is a part that explains the possible use of Artificial Intelligence (A.I), in the earlier days of Hindu civilization. Here, Yoga Vāsistha describes the application of Artificial Intelligence (A.I) and also about human-like emotions such as ego in robots. The book mentions, Sambarasura who is well known to have mystic powers and could raise himself in the sky and fly to outer space, creates War Machines or Robots. Sambarasura was an Asura and Rig Veda clearly mentions that Asura does not mean ‘Demon’. In fact, Asura means ‘the one who is not sura, or one who has magical or phenomenal powers’. Hence, using his powers and his technology, he created 3 Robots and named them Dama, Vyala, and Kata. The name ‘Dama’ is derived from the root dam which means to tame, subdue, conquer, restrain; ‘Vyala’ means vicious, fierce, cruel, savage-like tiger or snake and ‘Kata’ was like a modern tank protecting army which was meant to go and cover the army. Those robot like asuras were lifeless machines and hence had no sentiments, no emotions. They were built solely to win over the Adityas and since, they were fearless, cruel, vicious, fierce and like a tank, they could never be defeated by the Adityas. These war machines that always won the wars against the Adityas (Demi-gods) were later induced by Artificial Intelligence (A.I) into them. Meanwhile, Adityas started playing their own tricks. They began fighting Dama, Vyala, and Kata and then ran away. They repeated this many times and with multiple triumphs, it induced Egos in the Robots. They fought the three Robots and ran away, many times, with defeat. This was their tricks to sprout sentiments and emotions in them. Subsequently, following the rise of ego, the three started thinking like humans, which was largely due to their artificial intelligence. Adityas observed this change and got deeper with their own tricks. They told those Asuras, that it was due to their valor Sambarasura always won but he enjoys his life at the cost of their lives. Following which, it added more emotions and sentiments into the machines. They felt that they should also enjoy their lives. As more and more human sentiments arose, finally emotions of fear too arose in them. 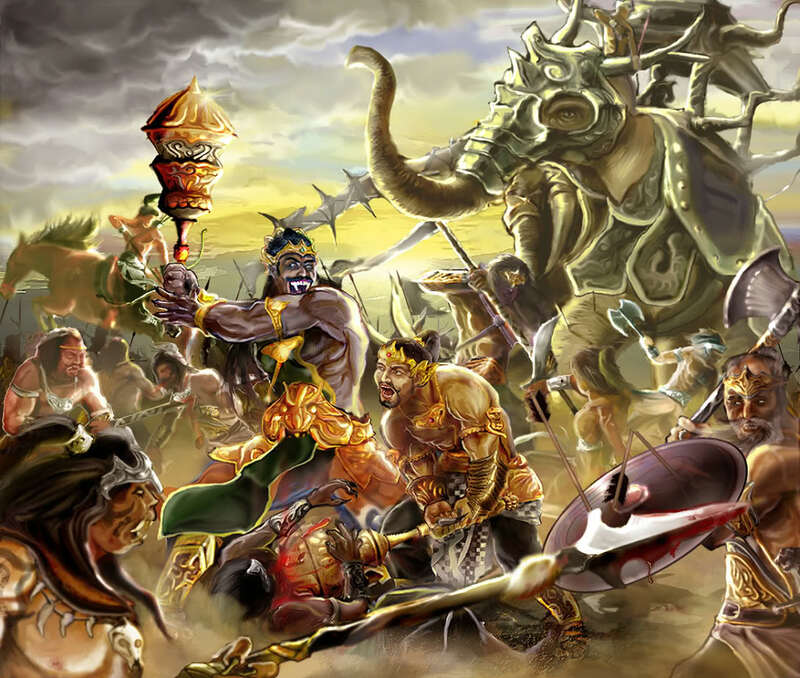 Naturally, they were defeated by Adityas as they could not fight with the previous zeal and viciousness. As a result, we can take this as a valuable lesson from our own history. For sure, we would all like advances in the fields of science and technology. However, we could also remember the different possible directions or consequences it could head towards. This is certainly an interesting story about ancient robotics, machinery and artificial intelligence which was mentioned in Yoga Vasistha that we can all learn from.